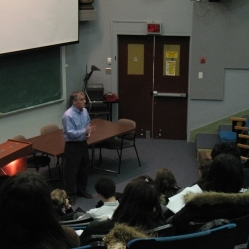 The Montreal Children's Hospital welcomed secondary IV and V students from West Island College and nine other high schools in the English Montreal School Board for a Student Career Orientation day. Seven healthcare professionals were on hand to give presentations about their field of work and why they chose it. Their passion for what they do was evident to the students who are thinking about careers in the health sciences. The students were very happy to find out more about what’s involved in these professions. Thanks to Drs. Nada Jabado, David McGillivray, Sally Bird, Christian Drolet, John Mitchell, and physiotherapist Carlo Galli and nurse Linda Morneault for helping to make this first Career Orientation Day at the MCH a success. Photo: Dr. David McGillivray explains why he chose to work in the ER.